"One of Joe Smith's weakest points was his jealousy of other men. He could not bear to hear other men spoken of. If there was any praise it must be of him; all adoration and worship must be for him. He would destroy his best friend rather than see him become popular in the eyes of the church or the people at large. His vanity knew no bounds. He was unscrupulous; no man's life was safe if he was disposed to hate him. He sat the laws of God and men at defiance." "The effect of those boxes was like magic. They created general confidence in the solidity of the bank and that beautiful paper money went like hot cakes. For about a month it was the best money in the country." (Interview by W. Wyl. See Mormon Portraits, p. 36; also Oliver Olney: Absurdities of Mormonism Portrayed, p. 4; the letter of Cyrus Smalling in E. G. Lee, The Mormons, or Knavery Exposed, p. 14; and Fawn Brodie, No Man Knows My History, pp. 194-8). It should be noted that Parrish left the church following this fiasco and began openly to describe Joseph's banking methods. He was later accused of absconding with $25,000, probably in bank notes which ultimately proved worthless. 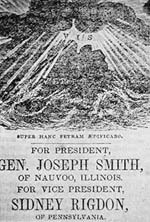 However, given the dishonest claims that appear to have been made regarding the bank's capital, the seemingly prophetic promises of prosperity in return for investment, and the fact that Joseph authorized and perpetuated the illegal operation of the bank in the first place, I personally consider this a poor reflection on Joseph's character and his ability to act under inspiration from God. In March 1844, Joseph sent another vaunted petition to Congress. This time he asked to be appointed an officer in the U.S. Army with power to raise 100,000 volunteers to patrol and police the western borders of the United Sates all the way from Texas to Oregon. "Although the prophets and authors of ancient religious history communicated God's condemnation against all sin, they also presented the clear understanding that God's servants continued to sin or "make mistakes," and were thus fully human despite a divine commission. Noah occasionally drank wine to the point of drunkenness and unconsciousness (Genesis 9:21, 23). Abraham acquiesced in his wife's mistreatment of his second wife (Genesis 16:6). Jacob "with subtlety" and deception obtained his brother's blessing from his blind father Isaac (Genesis 27:12, 35), and also hated his first wife Leah (Genesis 29:30-31). Moses at the least committed manslaughter prior to his call as a prophet (Exodus 2:12-14), and after that call occasionally exhibited doubt in God's word, fierce anger, and boastful arrogance (Exodus 4:10-14, 5:22-23, 32:19; Numbers 20:10-12). The Lord had to intervene directly to prevent Samuel from choosing the wrong man as king (1 Samuel 16:6-7). Daniel sought forgiveness for his sins while prophet (Daniel 9:20). Jonah resisted the commandment of God to him (Jonah 1:2-3, 4:1) Jesus drank enough alcohol at banquets to be criticized as a "winebibber" (Matthew 11:19; Luke 7:34). James and John, as apostles, delighted in the thought of their opponents being destroyed (Luke 9:52-56) and pridefully sought to elevate themselves above the rest of God's children in the eternities (Mark 10:35-38). Peter was impudent, boastful, arrogant, and cowardly as an apostle during the life of Jesus (Matthew 16:21-23, 26:69-75; John 13:8-9, 18:10-11). Despite Christ's command to send the Gospel to all nations at His ascension (Matthew 27:19; Mark 16:15; Luke 24:47), it required another specific revelation to Peter to persuade him that the Gospel should be taken to those who were not Jews (Acts 10-11), and even years after that revelation Peter continued to demonstrate his prejudice (Galatians 2:1,9,11-14). Nor did Peter hesitate to criticize the approach of his fellow apostle Paul in teaching the Gospel (2 Peter 3:15-16); Paul likewise boasted that he had publicly condemned Peter and "withstood him to the face, because he was to be blamed" (Galatians 2:11-14). Moreover, conflicts between Barnabus and Paul resulted in the disruption of their mission (Acts 13:2, 15:36-39).